Our AR550 Level III+ armor has 10% increase in core hardness, this ballistic grade steel perfectly hits the "sweet spot". It's much harder than AR500, but not too hard to cause severe stress while forming. We’ve taken our Level III Body Armor to a NEW level! Spartan Armor Systems™ is pleased to introduce our AR550 Body Armor! With a 10% increase in ballistic core hardness, our level III+ AR550 armor defeats higher velocity threats such as XM193, M855, and M80! We’re special rifle threat validated! Our AR550 armor hits the “sweet spot” in the Brinnell Hardness (BHN) range. With a core hardness of approximately 545-560 BHN, we have found our ballistically rated variant of AR550 that we use is perfect for defeating higher velocity threats, while not exposing the armor plate to extreme stress due to forming. Our AR550 Level III+ armor has our GEN2 lower cut radius. With a 10% increase in core hardness, this ballistic grade steel perfectly hits the “sweet spot”. It’s much harder than AR500, but not too hard to cause severe stress while forming. 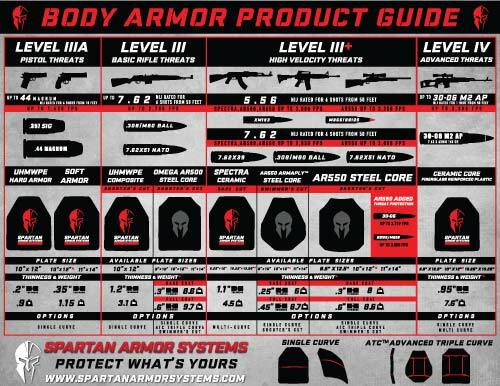 Advanced Triple Curve (ATC) AR550 Spartan Body Armor. An industry FIRST! Spartan Armor Systems™ is proud to be the FIRST in the industry to commercially offer triple-curved AR550 body armor. With higher velocity rifle threats commonly present throughout the United States, we’ve developed this AR550 armor to specifically defeat some common threats such as 5.56 x 45 XM193, 5.56 x 45 M855 /SS109 and 7.62 x 51 (.308 Winchester) at a rated velocity of 3,100 fps or less. Additionally, we’ve successfully defeated these threat profiles from Close Quarters Battle (CQB) distances…repeatedly! Chest Plate Weight (per plate): 8×10 approximately 6lbs 1oz (full coat), 10×12 approximately 8lbs 1oz (base coat), 8lbs 10oz (full coat), 11×14 approximately 11lbs 7oz (full coat). Side Plate Weight (per plate): 6×6 approximately 2lbs 9oz (base coat), 2lbs 11oz (full coat), 6×8 approximately 3lbs 6oz (base coat), 3lbs 12oz (full coat). Swimmers Cut: New product, weights to come. Please see our FAQ for weight specifications and other questions you may have. As with all of our AR550 Omega Armor products, we only use the highest grade of AR550 to manufacture our armor! Remember, not all body armor is created equal! Read our “FAQ” to find out more about the AR550 Armor we use to construct our body armor!